Untitled (Flag), 2002	Mixed media, paint, collage, etc. Celebrated pop culture artist Peter Max was commissioned by The Coca-Cola Company to create a mural as a special legacy gift to Salt Lake City for the 2002 Olympic Winter Games. The 6’ x 8’ mural was created by Max as a tribute to the spirit of the Winter Games and features artwork collected from youth across the U.S. during the Salt Lake 2002 Olympic Torch Relay. The Olympic mural is acrylic on canvas featuring Max’s unique rendition of the American flag with red and white stripes, stars and Max’s signature heart design. 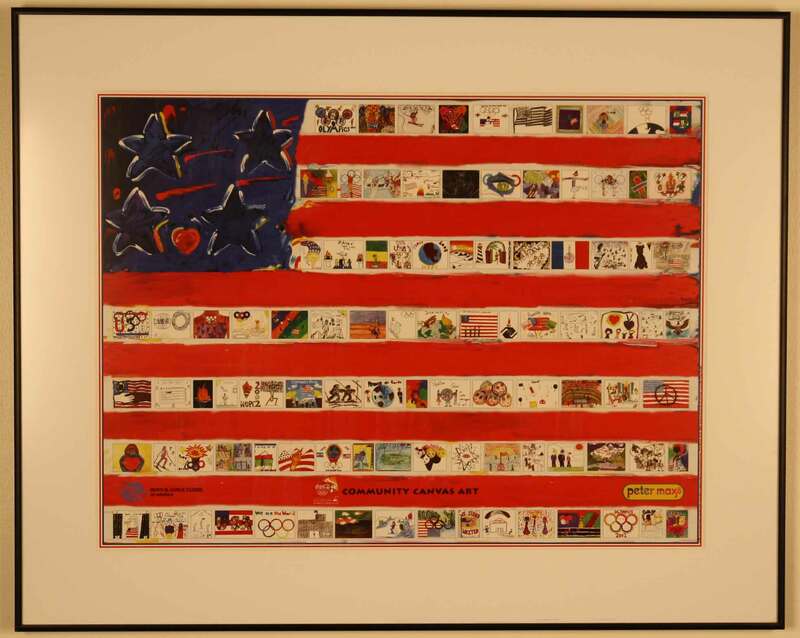 Approximately 100 pieces of children’s artwork from 38 states are interwoven in the seven white stripes of the flag. The children’s artwork featured in the mural was part of the Coca-Cola Olympic Torch Relay “Community Canvas” Art Contest. Coca-Cola invited young people from more than 120 Boys & Girls Clubs and other youth programs along the Torch Relay route to submit original artwork depicting inspirational people, places or events in their communities. Max used the original creations from these young artists to design the mixed media original work of art. “We created the Coca-Cola Olympic Torch Relay Community Canvas Art Contest to give youth across the country a chance to share in the spirit of the 2002 Olympic Winter Games. We hope this artwork will serve as a legacy and lasting reminder of Olympic festivities for Salt Lake City,” said Quinton Martin, vice president, Coca-Cola North America. The mural design was also offered as a commemorative poster during the Winter Games with proceeds benefiting the Boys & Girls Clubs of America.